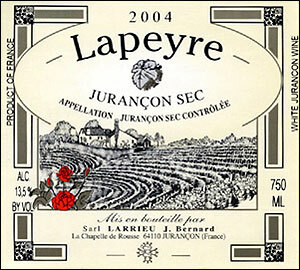 Jurancon winemaker Jean-Bernard Larrieu is the winemaker of the family-owned Clos Lapeyre. He lives just down the road from the domaine with his wife and two daughters, with whom he insists on speaking the local patois or dialect. The winery has been in existence since the first World War, at which time the Larrieu family made more money from the sale of peaches and cows than wine. Later, in the 1960s, more emphasis was placed on grapes, which were sold to the coopérative. The bulk of the estate's money, however, came from strawberries grown on the property. In the early 1970s, the family were the first to replant their vines on terraces, something that has now become common in Jurançon. This beautiful system, in which vines are planted in a semicircle — like an amphitheater — guarantees better exposure to the sun, encouraging further ripeness of late-harvest crops. The property now covers 10 hectares, the majority of which have a southern exposure. The soil is a mixture of clay and silt, with several chalky areas. 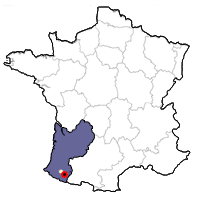 Gros Manseng and Petit Manseng comprise the majority of plantings, although Courbu still has its importance here. Average age of these vines is 15 years, although an older plot is comprised of 45-year-old vines. Four wines are produced on the property, two dry, two sweet. La Magendia de Lapeyre Jurançon - 100% Petit Manseng, fermented in new oak barrels. Tasting notes: Nuances of exotic fruits (pineapple, mango, passion fruit). Powerful, yet controlled toast and vanilla flavors, with a hint of additional wood spice. Plenty of fat on the palate is accented by a citrus note on the finish which helps lift the fruit to new levels. Very good length. Tasting notes: Pale gold color. Dried apricot, peach and vanilla on the nose, along with a floral note. Additional hints of citrus fruit and toast in the mouth. Medium body. Long, clean finish. Like a hypothetical blend of Sauvignon Blanc (without the herbs) and Chenin Blanc (without the earthy element). Vitage Vielh de Lapeyre Jurançon Sec - 60% Gros Manseng, 25% Petit Manseng and 15% Petit Courbu, then aged in large oak barrels. ​Tasting notes: ​The Vitage Vielh (local dialect for old vines or vieilles vignes). This wine is replete with tell-tale Jurancon flavors of pineapple and passion fruit, with additional notes of vanilla and spice. This would pair well with medium to full-bodied fish (halibut, sea bass) as well as sheep’s milk cheese.